Dramatic comedies have an interesting fine line to follow – make too much light of a situation and the film could fall apart into nothing but inane laughter. On the other side, a dramatic comedy with little to no laughs brings forth a problem of a subject matter that takes itself too seriously. The balance is key to creating a well-rounded plot that can be well-appreciated. Silver Linings Playbook, for the most part, takes that balance well into heart although perhaps sticking too closely to the tried-and-true plot beats. Nevertheless, the film is so slick in it’s packaging from it’s pacing to it’s characters and it’s messaging that the Silver Linings Playbook ends up as a serious contender for your attention. 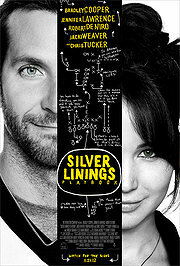 Silver Linings Playbook follows Pat (Bradley Cooper), a bipolar young man who has been sent to a mental institution due to an incident with his wife. After serving his time, he is taken home by his mother, Dolores (Jacki Weaver), to his football-loving father, Pat Sr. (Robert De Niro). However, Pat still is troubled at times and it is only until he meets his friend’s wife’s sister, Tiffany (Jennifer Lawrence), who is also going through her own set of problems, that he finds some solace to help his recovery process. The weakest parts of the film are that in terms of the film’s structure and general character arcs; there is little that stands out. The film is very conventional in how it approaches the general plot with few legitimate surprises that come out from just the story. Although, as explained later, the characters really move the film into more interesting territories, little can be attributed to the directions taken with the story which feel like a very typical romantic comedy. Much like Russell’s previous film, The Fighter, which was really constrained by it’s very typical underdog fighter plot route, Silver Linings Playbook feels similarly constrained by it’s fairly typical growth arcs that doesn’t pull many punches, even to the end. Also not helping are the plot devices that appear and although the film does not purport to make them revelatory, the fact that these various ‘devices’ are fairly obvious and unsurprising do not help to make these moments any less protruding. However, many of these plot problems are much more negligible compared to the success of it’s characters and aesthetic look into mental illnesses and their recovery. One of the most fascinating sections is the acting and characters. There are simply some fantastic performances here that are engrossing and full of life from both the obvious set of actors and some surprising turns as well. Lawrence continues to amaze audiences with another fascinating turn as Tiffany, playing an individual who is depressed and awkward yet full of pizazz and sporadic energy. Complementing her is an equally fairly bombastic yet emotionally distraught performance from Cooper who gives a very surprising performance as the mentally disturbed Pat. Together, Pat and Tiffany become absolutely fascinating to watch interact on screen as their two tough personalities collide and complement each other in both energetic and quieter scenes. Although a bit much at times due to how sporadic these outbursts and energetic squabbles can be, it feels very appropriate given the subject matter and how these individuals’ minds are working on overdrive at nearly all times. Complementing their performances are some good supporting roles such as De Niro and most of the other cast. Just as well, the energy from the cinematography and editing define this very crazed state of being as well. There are lots of cuts throughout the film and scenes fly by quite quickly. As Pat descends into a state of frenzy, the film equally spirals into a controlled state of unrest with the camera falling all around and the cuts becoming all the faster. Again, it becomes quite taxing at times to watch simply because so much information is being conveyed, but the way it works itself into the themes and emotions within a scene makes it all the more spellbinding to watch. Silver Linings Playbook is a film that doesn’t innovate exactly in terms of it’s fairly typical narrative beats but is a delight of a film in nearly every other respect. True, there is nothing particularly spectacular about some of the film’s obvious plot devices and the nominal and unsurprising plot arch. However, simply focusing on these points does the overall film discredit as there is a bountiful amount of great praise that can be seen in this film from the spectacular acting showcases of much of it’s cast (especially Cooper, Lawrence and De Niro) to the more than appropriate frenetic pacing and editing to the amount of time it spends on it’s characters and relationships. Silver Linings is a fairly steady look into mental illnesses that still carries a light heart on it’s sleeve without sacrificing it’s integrity. It’s a joy of a film to watch that satisfies as both a crowd pleaser and a serious repertoire. Existential films always have a fine line to balance in their pursuit to find the reason for human purpose. The beautiful aspect about this ‘genre’ of films is that they can fall under any really as they weave and explore different aspects of the human life to find meaning and reason. Few, however, touch the complexity found in Cloud Atlas, a very daring adaptation of an equally daring fictional book. Although it’s own ambitions is simply really too enormous to fit into one film unto itself, there is no denying that there is an absolutely fascinating pull to what Cloud Atlas has to say as a containment for film and a fascinating expose of the human life and beyond. Cloud Atlas follows six storylines among a continuum of time starting from the late 1800s to the far-flung, unknown future. The stories range from a lawyer who is sick at sea and must deal with a stowaway; a conniving musician who is inspired to finish a grand music piece under the guidance of a great composer; a mystery thriller in which a reporter is trying to uncover the importance of a power plant; an elderly man who must try to figure out a way to repay his debts; a future with a replicant who has a personality; and a far-flung future in which man has returned to the wilderness. The main actors, including Tom Hanks, Halle Berry, Hugo Weaving, Jim Broadbent, Jim Sturgess, and Donna Bae, play a variety of roles throughout these storylines. Cloud Atlas both struggles and thrives on it’s ambitious concept with many of it’s detractors also being it’s core strengths. This statement seems unfair for any film since it doesn’t offer a definite critique, but because of the nature of Cloud Atlas, there is no simple way to approach a straightforward analysis and review. For instance, the film’s choice to use it’s main cast of actors (and some side characters as well) in nearly all of the storylines is daring although not always effective. Some of the character changes are quite dramatic and effective, creating for some fairly fascinating moments of disbelief in an impressive usage of makeup and acting prowess. Unfortunately, some of these changes are not as effective as certain storylines take place in specific parts of the world which even some of the best makeup cannot change (the future storyline with Somni is most affected). The acting also gets put on full blast because of this decision and once again, the mileage varies. For the most part, the acting troupe works fairly hard to make their characters work and feel fairly distinguished with special mentions going out to Tom Hanks, in one of his most challenging series of roles, and Ben Whishaw, who delivers some of the film’s most interesting moments. All-in-all, in my opinion, the thematic implications of utilizing this mechanic is understandable and gives the film more weight – playing on the core of the film’s concepts about destiny and karma that could resonate in any person regardless of race, gender, sexuality or more. Speaking of these themes, Cloud Atlas also will be heavily looked at because of it’s deliberate focus on these existential and philosophical musings and it’s structure. Unlike the book it’s based off of, the film adaptation feels free to really play with the editing heavily. This means that the plot really frees itself to go back and forth from storylines with what seems like at first, reckless abandon. However, the trio of directors try to utilize the film medium to really make comparisons in the storylines much more apparent as well as try to convey the themes a bit more openly. Timelines are transitioned into one another at times and direct comparisons are made on a frequent basis. The end result is intriguing to watch unfold although will most likely baffle most audiences. Much of this is due to how well the stories are explained and fleshed out. Some of the stories on their own do not seem to hold as much weight or just don’t play out as interesting whether it’s due to the lack of changes or changes made from the original novel or where it is placed on the narrative thread. Some may also be bothered by the frequent monologues that really try to reiterate the themes as much as possible. What I believe most people will agree on is that the idea itself is unique to see play out – six stories that have their own unique genres and (mostly) set of characters that are linked more by abstract ideas and concepts, and the mileage on which it is effective may vary on how much an audience member may understand what transpired on film and once again, pays close attention to the thematic qualities of intertwining fates. The film’s aesthetics, for the most part, are something that is a bit easier to approve of. The music, in my opinion, is one of the strongest parts of the film. It gracefully transitions from scene to scene, really embodying each of the six separate storylines with it’s own strong melody while still being able to connect the entire film as well. The camera work, for the most part, is also a delight to watch with some great action and dramatic set pieces set up to again, repeat that theme of similar historical beats and interconnecting lives. It’s a beautiful marriage of careful planning and kinetic force. Finally, the special effects work in itself is not exactly groundbreaking but the overall production still feels polished with little to really nitpick on and conveying the stories’ time periods well. Cloud Atlas is nothing short of astonishing in many ways. True, it’s filled with many imperfections, weighed down both by it’s ambition and attempts to wade through the twisted tangled plot threads with too much of a overly preachy thematic set. However, although many will be bogged down and turned off by these inconsistencies (and it’s long running time), the final product is an absolutely fascinating piece of cinema. Full of symbolism, meaty themes, rapid tonal shifts and some of the strangest performances and make-up work in any film thus far this year, the film bombards the viewer with it’s fairly kind adaptation of the equally complicated (if not more so) book it’s based off of. 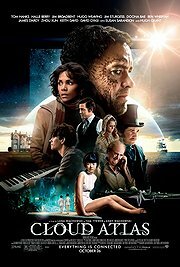 It doesn’t always work or resonate, but there is no denying in my mind that Cloud Atlas stands as a unique piece of art and an existential piece on our lives and trying to comprehend death, love and connections throughout space and time. I’m glad a film like Cloud Atlas exists to continue to explore the nature of film in absolutely bizarre and engrossing ways.